If you are fortunate enough to have a delicious batch of tamales, the last thing you want is for any of them to go to waste. While tamales are deliciously appealing to the taste buds, they aren’t the quickest to make. But, with these great tips, you can learn all that there is to know about tamales and how to properly reheat them to their original, moist texture and say no to dried out masa tamales that are overcooked and lacking. We have all of the tips and tricks to keep your favorite tamales tasting as fresh as the moment you first cooked them, and the best part is, the flavors in the tamales will continue to increase during refrigeration or freezing; giving you the most delicious tamales anytime you want them! 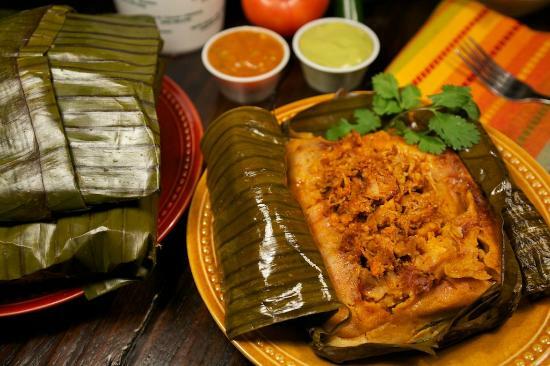 What are Tamales?How to Assemble and Cook TamalesHow to Know when Tamales are done? 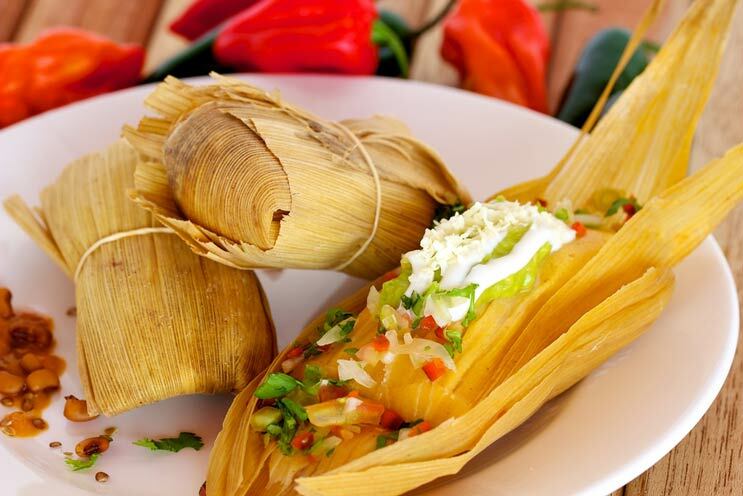 Tamales are a traditional Mexican delicacy that is made with a wet mixture of masa or Mexican corn flour. The masa is well seasoned, typically with a meat broth and spices. The masa filling is often paired with seasoned pork, beef, chicken, chorizo, or a cheese and chili blend. You can also find a variety of sweet tamale recipes that include dried and fresh fruits. Once a flavorful masa dough has been made, and the other filling choices have been prepared, they are wrapped in corn husk for steaming. In some areas of the world where corn husk is not readily available, banana leaves and plantain leaves are used to gain the same steaming effect. The assembly is relatively simple, but most recipes make a lot of tamales, anywhere from ten to hundred. The assembly process requires the corn husk to be soaked overnight, to allow them to be pliable and easily wrapped around the filling. Once well-seasoned, the masa mixture is spread onto the bottom half of the corn husk, and then a small amount, around 1-2 tablespoon’s, of the filling is placed towards the bottom. When the corn husk is wrapped, the masa will encase the filling creating a tender and creamy masa exterior all while encasing the filling like a delicious little surprise. The tamales are secured with a small piece of twine or corn husk this is tied around them to avoid opening during cooking. 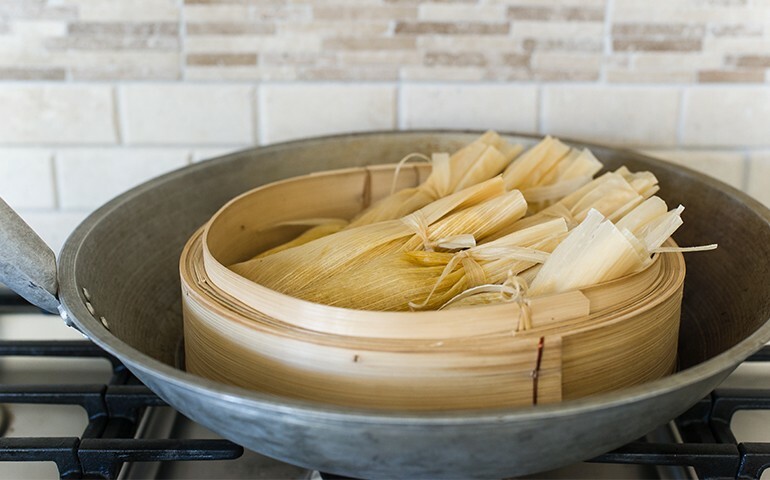 Tamales are cooked in a steaming basket and never directly contact heat or water in the process. Tamales are steamed until the masa dough is tender and will pull away from the corn husk with ease. Depending on the number of tamales you are cooking, a large pot with a steamer basket will do the trick. 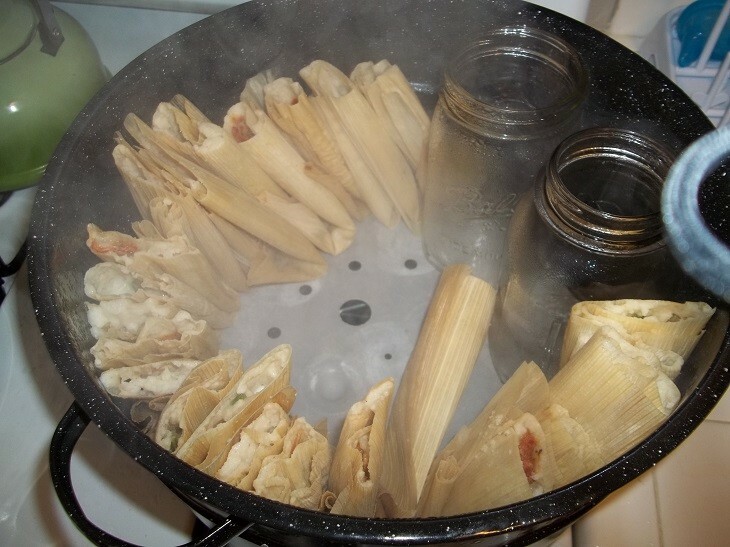 If you are looking to cook a lot of tamales, you can purchase a tamale steamer with a basket. It is essential, a larger than a normal pot with a specialized basket for holding more tamales. 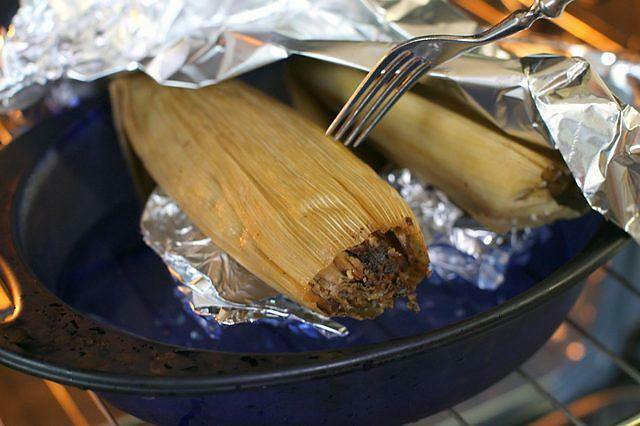 Many people have also started steaming tamales in smaller batches in their slow cooker by creating a layer of foil to hold the tamales out of the water while they slowly steam. It is also very common to pack the steamers with extra corn husk to increase the flavor and moisture. How to Know when Tamales are done? The required cooking time for tamales varies, and overall, it comes down to how many tamales you are cooking at one time. 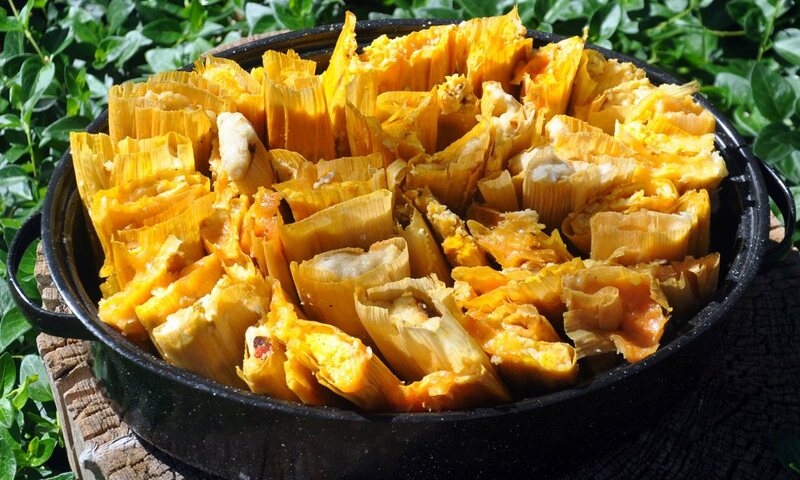 A large steamer packed with more than a dozen tamales can take hours to cook, and you must be sure that the steamer doesn’t run out of water during the cooking time. Follow to cooking time on your tamale recipe, but always be cautious and aware the time may vary. To check for doneness, remove one tamale from the steamer and slowly unwrap a small portion to expose the filling. If the masa is still wet and pastes like, it isn’t fully cooked. When cooked all the way through, the masa should have a firm appearance that can be completely unwrapped without sticking to the corn husk. Once your tamales are cooked, the hard part is over, and it is time to enjoy! Storing cooked tamales is simple; they can be stored in the refrigerator for about a week by simply wrapping them in plastic wrap, a Ziploc bag, or even an air tight container. For freezer storage, you should pick your storage method based on how many you want to reheat at a time. If you are reheating all of the tamales, you can easily freeze them in an airtight bag or container. But, if you want to be able to individually re-heat the tamales, you should individually wrap them so that you can remove your preferred amount from the freezer rather than the entire container. Once individually wrapped in plastic wrap or foil, you can then place the tamales in a container or freezer bag for added protection. Frozen tamales can last for around six months. Know that you know everything there is to know about tamales, you need to know how to properly reheat them without drying them out. For this task, you have several options. You can use the oven, microwave, deep fryer, stove top, or back in the steamer. First thing first, if your tamales are frozen, they need to be completely thawed to room temperature before beginning the re-heating process. Reheating your favorite tamales in the steamer is simple and less time consuming than cooking them in the steamer. Only leave them tightly wrapped in the corn husk, place them back in the steamer basket, and heat for around 20-minutes. The tamale should come out perfectly cooked and still moist. To reheat tamales in the microwave, just place the desired amount in a microwave safe container or microwave safe bag. Put a few tablespoons of water in the bottom to produce steam and leave the bottle slightly open. Microwave on high for two minutes per tamale. The microwave method is the quickest and easiest way, but it can also leave your tamales dry. Be sure not to overcook them and keep in mind that you can always put them back in for longer, but once they dry out, there is no returning them to the moist texture they once had. To begin with, preheat the oven to 425 degrees. Remove the tamales from the husk and place the masa rectangles in a buttered oven safe dish. The oven method is great to bring out all of the delicious flavors in the tamales and give them a golden crisp exterior. The tamales are done when they begin to crisp and turn golden brown. To deep fry tamales, you must first set your deep fryer or deep frying pan with oil to medium heat and allow it to fully preheat. Cold oil will leave you with soggy unappetizing tamales. Remove the husk from your tamales and place the masa rectangle in the oil for 2-3 minutes or until a crisp golden brown exterior has been reached. Allow to slightly cool to avoid burning and enjoy! The stove top method is just as simple as the others and to most, one of the most convenient ways to reheat tamales. To begin, preheat a frying pan with a teaspoon of olive or vegetable oil over medium heat. Remove the corn husk from the tamale and place the masa rectangle in the pan. Flip the tamales every 2-3 minutes and allow to cook until they are evenly golden brown and crisp. 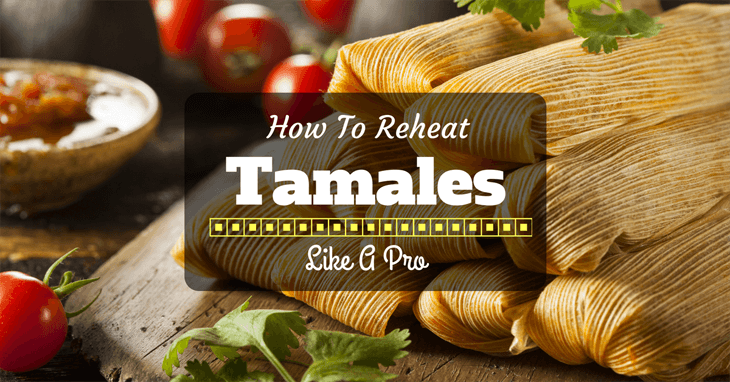 Whether you are a first-time tamale cooker or a seasoned pro who is looking for the best way to make your delicious tamales go further, you can bet that one of these great reheating tips will get the job done. Think of how happy your family and friends will be when they learn that you can give them their favorite tamales anytime! Do you have a favorite tamale tip or trick, or maybe you have tried one of ours? Let us know in the comments!